Carver + Schicketanz Architects’ eco-friendly renovation earned this mid-century-modern home LEED Platinum certification and proved that when it comes to building sustainably, it’s all about the little things. 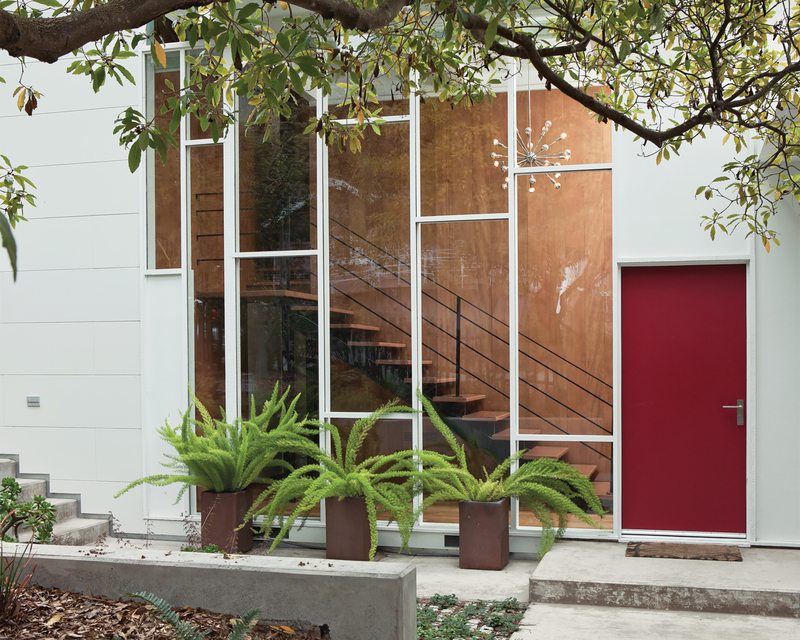 With the help of Carver + Schickentanz Architects, Jason and Melissa Burnett were able to push their Carmel, California home's renovation from LEED Silver status to LEED Platinum-certified. With eco-friendly innovations like a retractable skylight for natural ventilation, double-pane windows to keep in air and heat, and sustainable landscaping with native vegetation, it's no wonder this mid-century-modern redesign is one of our green favorites. Click here to see the home's interior. The owners of this renovated mid-century modern home in California longed for an outdoor eating area, but with the house sited smack-dab in the middle of the 40-by-100-foot corner lot, the property offered neither adequate space nor privacy from the streets or neighbors. 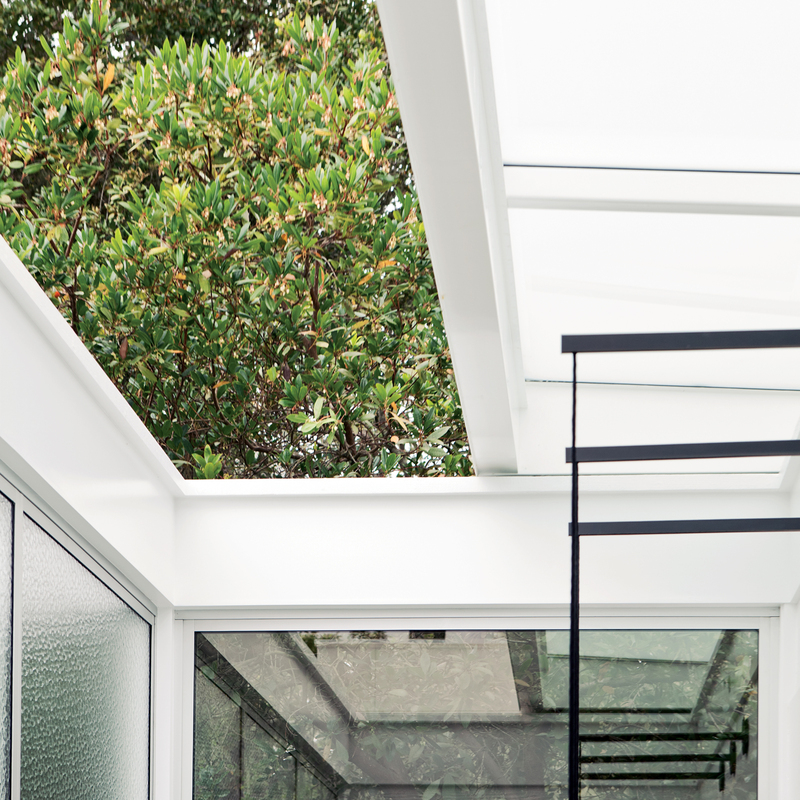 The design team specified a 14.5-by-6.5-foot retractable skylight over the dining room, which brings in sunshine and provides natural ventilation. 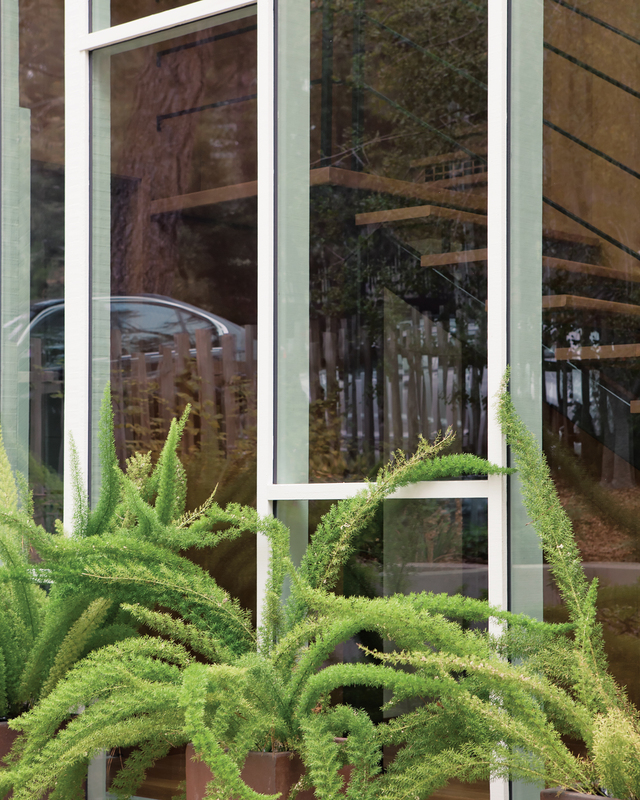 The Rollamatic window quietly transforms the space into a near-outdoor oasis in just over ten seconds. Photo by Mathew Scott. Driving by Jason, Melissa, and baby Sebastian Burnett’s home in the quaint coastal town of Carmel, California, you’d never know it’s LEED Platinum–certified. The 3.44-kilowatt solar array and rooftop vegetable garden are tucked out of street view and the recycled-denim insulation is hidden in the walls. Inside, the Control4 and Lutron lighting smart-home systems manifest only as a small touchscreen placed unassumingly in the office. Sustainably renovating their home was a matter of common sense for the couple. “It was an opportunity to push the envelope and practice what I preach,” says Jason, a former energy and climate-change policy advisor at the Environmental Protection Agency; a founding partner of Clean Fund, a company that finances renewable-energy projects; and a Carmel city council member. “We went through our laundry list of requirements—new siding, insulation, fixtures, and heating system—and realized that if we did just those things we’d probably earn at least LEED Silver,” Melissa says. When the couple teamed up with local firm Carver + Schicketanz, principal Mary Ann Schicketanz encouraged them to consider pursuing Platinum. Modern green homes have been Carver + Schicketanz’s bread and butter for more than two decades, and the Burnetts saw this as an opportunity for its work to be recognized. By making smart, small, and sustainable decisions at every step, the LEED points quickly added up. The Burnetts longed for an outdoor eating area, but with the house sited smack-dab in the middle of the 40-by-100-foot corner lot, the property offered neither adequate space nor privacy from the streets or neighbors. The design team specified a 14.5-by-6.5-foot retractable skylight over the dining room, which brings in sunshine and provides natural ventilation. The Rollamatic window quietly transforms the space into a near-outdoor oasis in just over 10 seconds. Like most Northern California homes built in the 1960s, the Burnett residence originally acted like a sieve, letting air and heat easily pass through its uninsulated walls and single-pane windows. “People just pretended it never got cold here,” Schicketanz says. In addition to putting in spray-foam and recycled-denim insulation, the design team replaced all of the windows with double-pane glass, which works wonders to hold the heat in. Even if you’re just replacing windows in a single room rather than redoing your entire house, installing double-pane windows, like ones from these manufacturers, will help increase your home’s efficiency. The two layers of glass sandwich a layer of air or inert gas to reduce heat loss and gain. Selecting windows with low-e coatings further reduces heat loss by diminishing infrared radiation. The architects preserved the existing oak floors but replaced the carpet with white resin, adding in-floor radiant heating along the way. “It’s the healthiest way to heat a home; you’re not blowing dust around your whole house,” Schicketanz says. Radiant-floor systems, like the Burnetts’ EcoWarm Radiant Subfloor, pump heated water through tubes laid under the flooring. The energy from the warmed floor transfers to the air, people, and objects in the room to heat the space. Schicketanz and her team also added hydronic fan convectors by Myson. 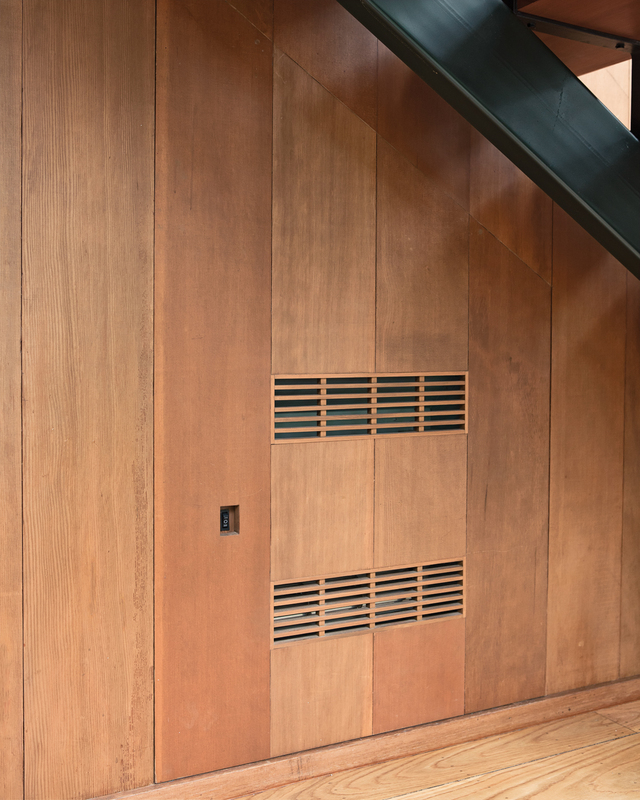 The in-floor tubing from the radiant-heating system extends up the wall and connects with the convector’s hot water coils. The coils act as heat exchangers, warming the air as it passes over them. The fan then pushes the air into the room, where it distributes the heat. Plan well before you install. “The most common mistake is to run the tubes under cabinets, which results in hot pantries and melted medicine,” says the architect. Finalize each room’s layout before installing the radiant heating. Zone the system by the sun’s movements. Assign separate thermostat controls to different areas of the house. Then, when the sun warms one side of the house, it won’t turn off the heating on the other. “Work with the sun,” she says. 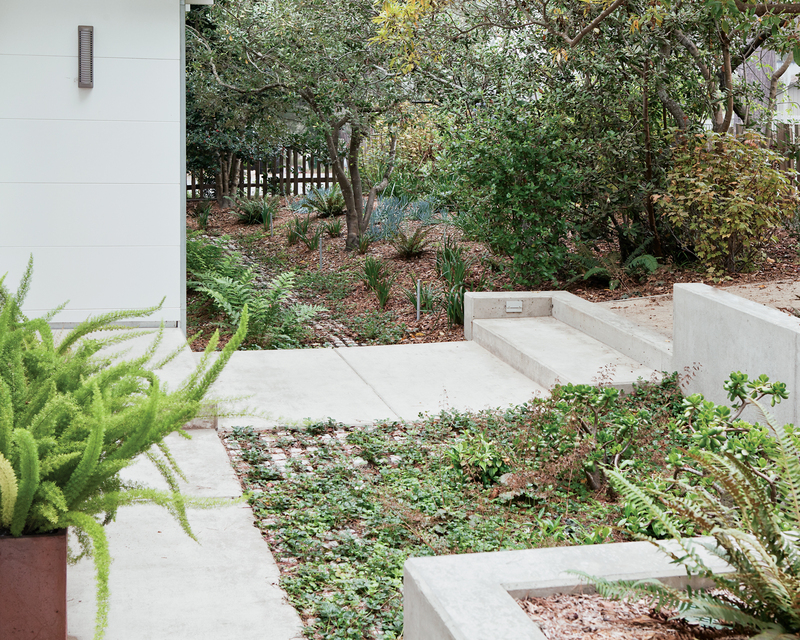 The architects worked with biologist and habitat restorer Fred Ballerini to replant the yard with native species, including Senecio daisies and Coast Live Oak trees. The driveway and paths around the house are made up of hundreds of four-by-four-inch concrete pavers that allow water to seep into the ground, important for avoiding runoff. By using small, well-spaced pavers, the architects were able to create paths and a driveway while still meeting Carmel’s requirement that no more than 10 percent of a lot be covered by pavement. Three-watt directional LED lights by B-K Lighting illuminate the path. On the western side of the house, the team built steps into the sloped terrain using salvaged eight-by-eight-inch concrete beams once used by the California Department of Transportation for road repairs. Most states have a native plant society, notes habitat specialist Fred Ballerini, who says to start there. Use plants that complement the ecological habitat. For the Burnetts’ garden, Ballerini selected plants from the California coastal woodlands, near the Carmel shore. Planting took place in the early winter months, thereby lessening irrigation requirements.